“There’s no place like home,” as the old saying goes. That’s especially true when it comes to an investment. You live in and love your home, but there might come a time when you have to leave it. And when that time comes, you’ll want to get as much money as you can for your property so you can move onward — and upward. In order to increase your abode’s value, you might think you have to put in a ton of time, effort and money, but that’s not entirely true. Instead, you can take on weekend projects over time to spruce the place up so when it’s time to sell, you have a completely updated property that’ll end up selling itself. Ready to get to work? Roll up your sleeves and start on one of the following five weekend projects. 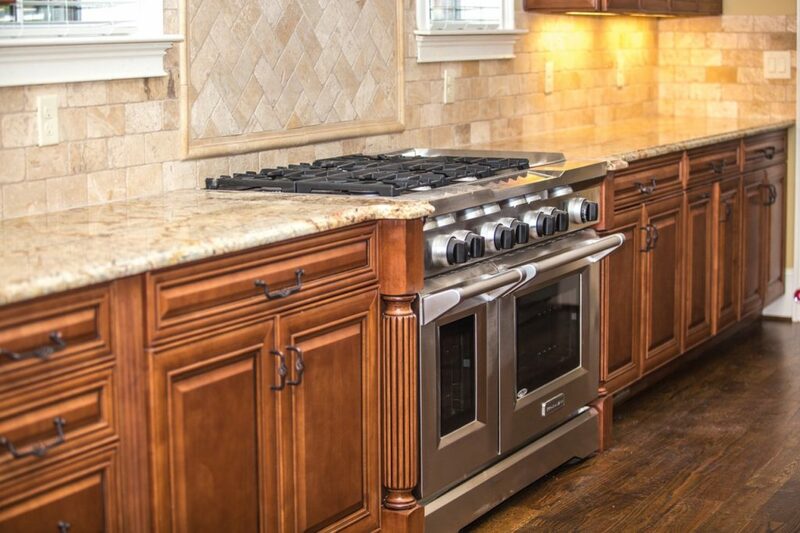 When it comes to smart investment in your home, the kitchen is one of the best places to start. Buyers expect kitchens to be updated. Stone countertops, stainless appliances and sleek flooring all make a space feel modern. Obviously, these changes require a lot of money and, sometimes, a lot of time. That’s why you can tackle it in bits and start first with your cabinets. Old wooden cabinets with equally dated hardware — think oak doors with shiny brass handles — don’t require a complete gut job. Instead, spend a weekend repainting them a more neutral hue. Finish the project off with new metallic knobs and pulls to complete the modernized look. Most homes have roughly the same ceiling heights, but there’s a little trick to make yours look bigger — crown molding. Yes, that white line at the top of your painted walls will draw eyes upward, making the room appear airier than it may very well be. These tend to be the make-or-break rooms when it comes to a big purchase. Crown molding adds a bit of detail, a feeling of luxury that’ll certainly add to the bottom line. No one will come in your home unless the first impression is stunning. Another DIY project should be a landscape overhaul of your front yard. It can be something as simple as adding a path of pavers to your front yard or sprucing up your flowerbeds with colorful blooms. All of this will catch the eye of potential buyers — and fatten up the bottom line of the offers they make. Another easy fix — your garage door. If it’s street-facing, it’s another area for prospective buyers to look at, and it has a great return on investment. You don’t have to stop with the front of your home. Especially if you live in a climate that permits lots of outdoor activity, you’ll want a backyard to match. Some may require you rent or buy tools for landscaping and other applications, but imagine the payoff with, for example, the beauty of a functioning fire pit in your backyard. Not only will you be able to enjoy it while you’re still living in your home, but potential buyers will easily be able to envision themselves sitting around a fire. Bathrooms have a big effect on buyers. They expect clean, modern updates, just like in the kitchen. Overhauling your powder room is an easy weekend task that might require small swaps, such as a new modern light fixture over the vanity or a new vanity altogether. You don’t have to shell out a ton of money to have someone else re-tile a wall or backsplash in your bathroom, either, if you have the patience to demo and tile the space yourself. Some accents once considered fresh and fashionable now give your home a dated appearance. You probably already know what in your home screams 70s, 80s or 90s. Whatever it is should go in due course. The list of outdated design elements is truly endless, but some of the biggest offenders are old-school wallpaper, the floor-to-ceiling wood paneling that may or not be actual wood, and, of course, popcorn ceilings. By removing these three offenders alone — a popcorn ceiling doesn’t take much effort — your home will snap right back into 2017. Once people start envisioning themselves living in your home, you won’t have to envision offers pouring in — they’ll start coming thanks to your hard work. You go, weekend warrior.